Some of the most violent injuries occur where safety should be greatest — at crosswalks. Pedestrians cross where they are supposed to cross and are still struck by drivers who are not paying attention or who are indifferent to the safety of those around them.At Chambers & Noronha of Orange County, we represent pedestrians who are hurt by negligence, as they seek compensation for medical bills, lost income, pain and suffering and — in the case of pedestrian fatalities — funeral-related expenses for survivors. Crosswalk knockdowns are not the only kind of injury-causing pedestrian accidents. Others include bicycle collisions, transit vehicle accidents and accidents caused by reckless drivers making unsafe turns, running red lights or failing to yield the right of way. Some of the most unacceptable accidents occur to young children trying to cross the street. Other accidents are due to mechanical failures involving brakes, steering and tires. Some are caused by distracted driving — people talking on cellphones, texting, eating their lunch at the wheel or changing stations on their car radios. Regardless of the cause of pedestrian accident injuries, if a wrongful act or negligence played a role, our lawyers have the experience and legal know-how to plead your case and obtain maximum damages. Our attorneys work to maximize your damage recovery, relieving you as much as possible from the legal tasks so you can focus on your own personal recovery. 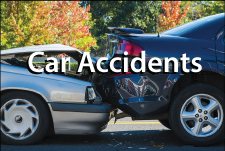 Were you struck down in a motor vehicle accident? Call the Santa Ana pedestrian injury lawyers at Chambers & Noronha. Call 714-558-1400 with your questions — or ask them by email.